There are a lot of children living here. They will even go for chopped cilantro! just out of the oven covered in gooey cheese. They love it when I make it…. And when I let them eat chocolate bars for breakfast. 1. Early on in the day whip up a batch of this Honey Wheat Pizza Dough, or this Fabulous Pizza Crust. You can also make the dough 2-3 days ahead. Just a little heads up, both recipes make enough for 2 twelve inch pizzas. The BBQ Chicken Pizza Toppings you see above you are for only one twelve inch pizza. 2. Spread some olive oil on a stone, or baking sheet. Place half of the pizza dough on the stone…or sheet…or what ever you are using. Let it hang out there for about 5 minutes. Then, spread it out to the corners of the pan. You don’t have to use a rolling pin here. Just stretch it out with your pretty little fingers. If you have big chubby fingers….well. All the better, I suppose. 3. Take some grilled chicken strips and slice cut them into chunks. 4. Pour the Sweet Baby Ray’s over the top of the crust. 5. Sprinkle half of the cheese over the top of the sauce. 8. Then the rest of the mozzarella and all of the Parmesan cheese. 9. Dot the top with a little bit more of the Sweet Baby Ray’s. It’s sweet, baby. Really sweet. 10. Bake at 450 for about 15 minutes, or until the cheese is bubbly and the underside of the crust is golden. 11. Sprinkle the cilantro over the top and vwalla, baby. You are going to be feeling pretty darn sweet your self. This looks great! I can't wait to try this with your crust recipe from yesterday. 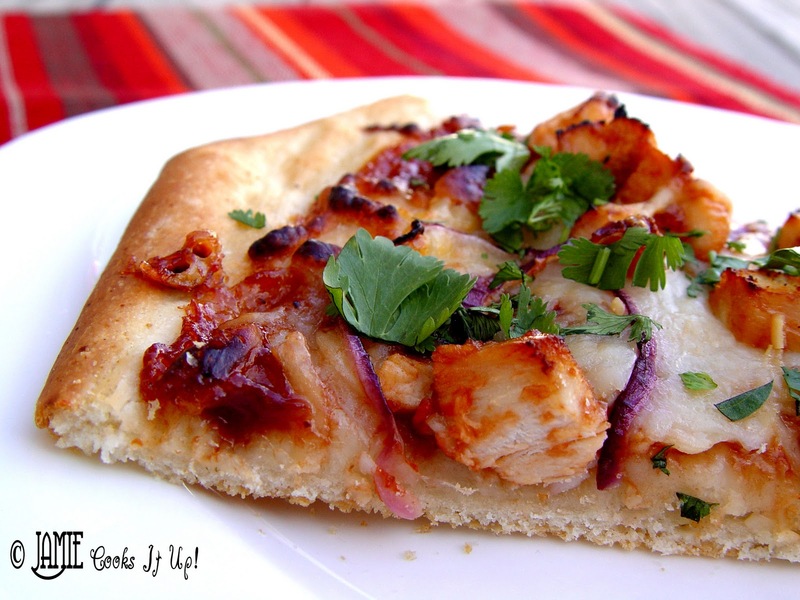 We make a bbq pizza fairly often at our house, it's definitely one of our favorites! Love the addition of cilantro, we always have it in our fridge, but never put it on the pizza! Do you preheat your pizza stone? It looks like you make it on it and then put it in the oven? My absolute favorite pizza! Looks so good. I have heard of people pre-heating the stone before they bake on it. I have to admit…I am nervous to try it! I feel like I might burn the heck out of my fingers. Let me know if you try it and how it goes! One word Jamie, AMAZING!!! GREAT recipe! LOVE the cilantro on the pizza along with the honey crust. Thank you for the BEST pizza recipe I have EVER made! YOU are the GREATEST!!! yummmm. this looks delish! and sweet baby rays is the best and only bbq sauce in my house. can not way to try this recipe (and the honey wheat crust!) thanks jamie!! I liked ur Pizza oven is very much ……..it nice to see ur blog………. Just made for dinner tonight…delicious! I was impressed how well the crust turned out, think and crisp! Thanks for the yummy recipe, haven’t had a bad one yet.